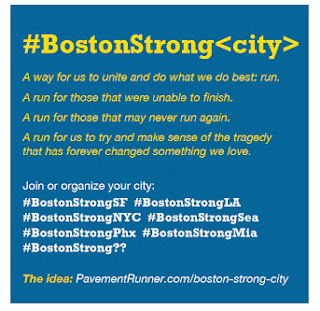 Brian @ Pavement Runner called upon runners worldwide to come together 1 week after the horrific events that took place at the Boston Marathon. I had been wanting to do something, anything for Boston. 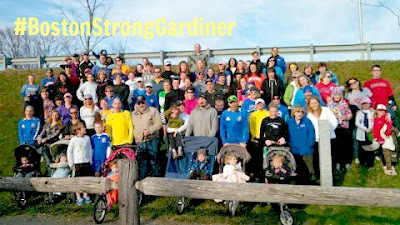 When I saw Brian's post, I knew that organizing #BostonStrongGardiner was exactly what I needed to do. When Monday night came, I didn't know what to expect. I was completely overwhelmed by the turnout. We had over 70 people come out to show their support. 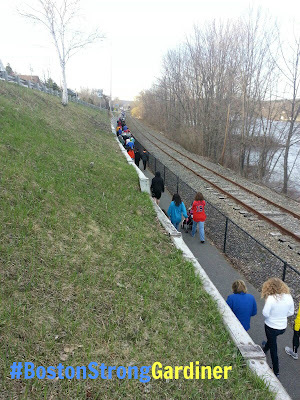 My family, the Rail Trail Girls came out with their families to run and Harold from Veteran Runnah. I even had friends drive over an hour with their families to come and run. It was an amazing turnout. One of the runners who came out Monday night is a local sports columnist, Scott Martin. I've been following him on twitter and I'm "friends" with him on DailyMile, but Monday night was the first time I met him in person. After Monday's run, he had this to say about the experience. I even had a phone interview with Ernie Clark, sports writer from the Bangor Daily. It's incredible to be part of a global movement to honor those who died or were injured due to the explosions. Thank you, Brian, for putting together such a beautiful and meaningful event. way to go! what a nice idea. i wasn't able to make the toronto one but i am still on the look out for a virtual race to support the cause. Great job! What a wonderful turnout. What a great turnout!! Great job organizing the event! I'm glad you had such a wonderful turnout!! I don't think that Rochester did anything but I know that lots of cities did. LOVE LOVE LOVE reading these recaps! !